Since he first opened the doors to Alexandria Toyota in 1984, Jack Taylor has thread philanthropy into his business model. Taylor has a distinguished track record of supporting countless civic and charitable organizations with his time, money and effort. 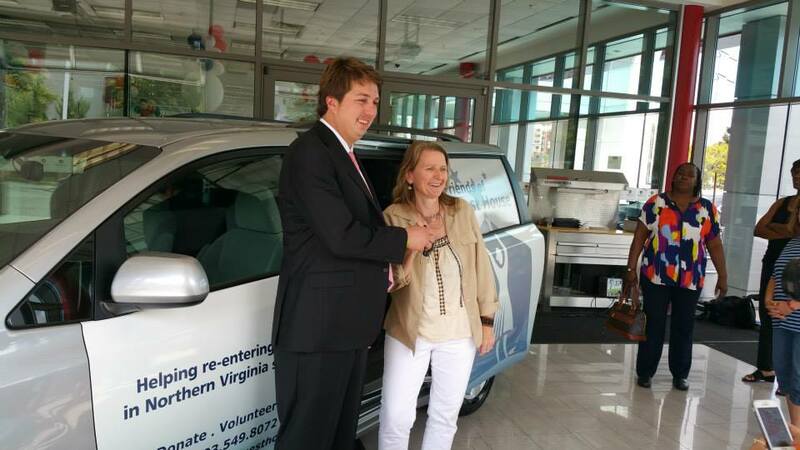 Alexandria Toyota’s beneficiaries have included, The Run for Veterans, Art on the Avenue, Del Ray Music Festival, Alexandria City Public Schools, and the Parkinson’s Foundation of the National Capital Area, just to name a few. He’s donated over 20 vehicles to charities including Capital Hospice, the Salvation Army, the Alexandria Police Department and Alexandria public schools. Every year, Taylor sponsors Golf and Field Day events which are a widely attended and have raised over $1.5 million for Capital Caring, and the most recent addition of The Michael J. Fox Foundation for Parkinson’s Research. For the last few years, Taylor has split the donations since his diagnosis of Parkinson’s in 2011. 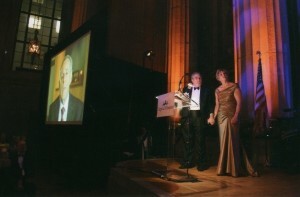 For his good works, Taylor has won numerous awards, including the Alexandria Business Philanthropy Award, the Heart of the Community Award from the Hopkins House, the YMCA Strong Communities Award and the Passion for Caring Award presented by Capital Hospice, now known as Capital Caring. Taylor’s passion for giving back has also inspired his 190 employees. They have formed teams representing Alexandria Toyota to give back to the community including raising funds and walking for the American Diabetes Association, the Parkinson’s Foundation of the National Capital Area, collecting canned goods around Thanksgiving for the local YMCA, sponsoring a local foster child and low income family for Christmas, among other initiatives. While Taylor gives to a variety of organizations both locally and around the country, there are three he is particularly passionate about. These organizations – Friends of Guest House, the Alexandria Scholarship Fund, and Capital Caring – are all local organizations serving three often overlooked groups: women, college students and the elderly. Please note, all proceeds that would have been paid to develop and create this submission were donated to the Scholarship Fund of Alexandria. Friends of Guest House is a 501(c)(3) charity that helps Northern Virginia women make successful transitions from incarceration back into the community. It is the only group in the area providing women recently released from incarceration with re-entry support that is both comprehensive (including a 24/7 residential component) and tailored to women’s unique needs. Without re-entry support, 70% of ex-offenders nationwide re-offend within two years. Among Guest House graduates, fewer than 10% re-offend. In 2015, Taylor received a donation request from the group to purchase a van to transport the women to interviews, jobs, medical appointments and more. Their mission struck a chord with Taylor, who decided if they could fundraise $10,000 he would provide the remaining funding to help them purchase a brand new Sienna minivan, through Alexandria Toyota. In addition to the donation, Taylor designed graphics for the vehicle with the Guest House logo. The idea was to provide the women with expanded visibility in the community to help garner attention and additional donations. Jack Taylor has donated over $2 million to Capital Caring over the course of 20 years. The organization has helped over 84,000 patients and families in the Washington area make the most of their time together by offering coordinated care, comfort and dignity to those living with serious illness. Since its founding 35 years ago, Capital Caring provides access to services for anyone in need of pain relief and symptom management as well as emotional support, regardless of their ability to pay. In 2006, Jack received Capital Caring’s highest honor with its Passion for Caring Award for his tremendous achievements and commitment to hospice. This award shows Jack’s passion for supporting hospice, going above and beyond monetary giving. In recognition of his generous gifts to the Adler Centre for Caring, two training rooms are named in honor of his mother, Pauline Taylor, who passed away with the aid of Capital Caring in 2009. For 30 years, the Scholarship Fund of Alexandria (SFA) has provided financial aid and college advising to more than ten thousand graduates of TC William High School and their families and awarded scholarships with a total value of $12 million to more than 4,300 students. Jack Taylor has been involved with the Scholarship Fund for over 24 years and has contributed more than $1.5 million through car donations, matching funds and new giving. With today’s value of scholarships of $3,000, that total funds 507 students — an entire year’s class that goes to college. For this year’s 50th Anniversary of TC Williams High School, Alexandria Toyota contributed $50,000 to the Scholarship Fund. This amount was matched by the board and also matched by the community for a total contribution of $180,000. In the past, Alexandria Toyota has put up $175,000 to be matched by new giving. For the past nine years, the dealership has donated cars to be raffled at the annual fundraising Gala, raising $630,000 in raffle ticket sales. 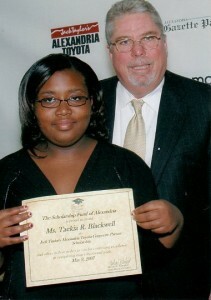 Taylor has also funded several scholarships within the Fund. Ninety-three cents of every dollar donated goes into the fund, supporting students that come from over 80 countries and speak more than 60 languages. This year, the Fund will award $900,000 in new and renewing scholarships and 87 percent of 2015 graduates went on to higher education. Recipients of an award are 50% more likely to graduate from college than other TC Williams graduates.